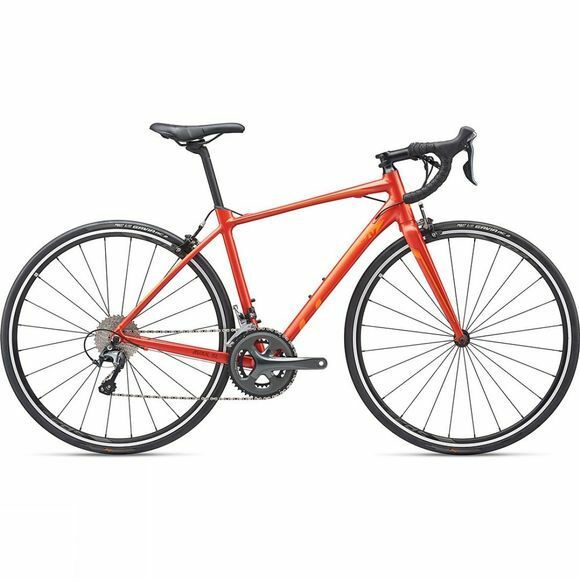 The Avail SL 2 2019 from Liv is an endurance road bike that is fit to handle those long days on the road. From epic solo adventures to group road rides, this lightweight bike can lead you down new roads and to up to new heights. Handcrafted with ALUXX SL, Liv's highest grade aluminium, this bike's modern endurance geometry delivers a smooth all-day ride experience. By providing pedalling efficiency, razor sharp handling and added compliance, you'll never want to stop riding. Every element of the bike is designed to create the most comfortable and efficient bike possible. An integrated D-Fuse seatpost reduces road vibration and fatigue while the OverDrive steerer tube, for increased frontal stiffness and precise steering, and the PowerCore bottom bracket transfers power directly from each pedal stroke to the road. Powerful Tektro calliper brakes mixed with reliable Shimano Tiagra components and a compact frame geometry offers expert handling and control, no matter the weather and road conditions. To top it all off, the Avail SL 2 2019 shines with elegant, modern style.